Hello Friends, It’s time for another challenge over at Just Us Girls! 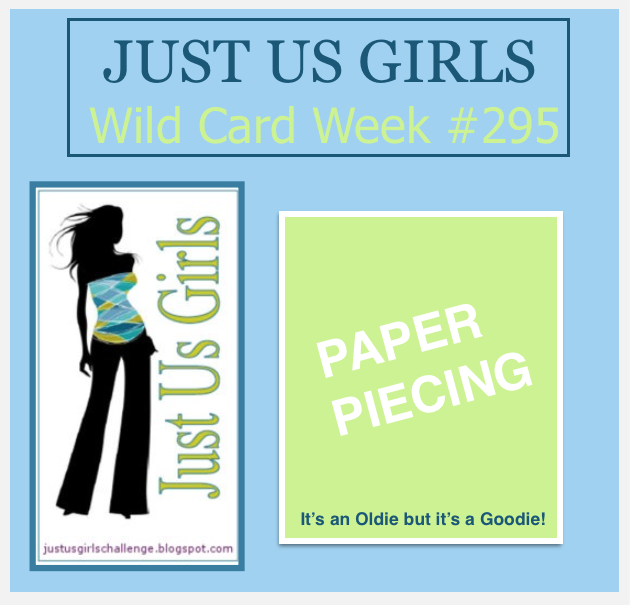 It’s the 5th Saturday of the month, so it’s Wildcard week, and Sharyn has chosen Paper Piecing this week. I never get tired of this technique! I PP the paintbrush and paint tube, in case you were wondering. I just got this new set from Paper Smooches and I couldn’t wait to start inking it up. My hubby asked me why I waited so long to get this set, being an art teacher and all! That is a very good question, that I have no good answer too! This set is going to make Perfect Thank You cards for him to give to his students in years to come, and that is what this one is for. Please come on over to Just Us Girls and check out what my fabulous teammates did this week, and while you’re there please join us! I would also like to thank Tenia for being our Guest Designer this month, you did a Super job!! That is awesome. Love the bright colors on it. Darling card, Nancy. I have that set but haven’t taken full advantage of it yet. Super CUTE card!! Thanks for having me this month!! I had a BLAST!! Love your card, especially the embossed frame! Boy this card is right on for the thank you that your hubby’s students will receive. I love your design with it and the PP is a real nice touch on this one. So cute how you made it a little wonky! This is such an awesome design!! What a fabulous set for you. Love! What a fabulous set and you have definitely done it justice! Love the paper piecing and those brush strokes. Such a simple but fabulous card. Just goes to show you don’t need to paper piece too much for the dramatic effect you achieved. Love it! This is adorable! Love the bright colors and your design! This is incredibly cute! Love the colors and the fun stamps. Very cute card! Love these Smooches set Nancy. Such a sweet card and sentiment. Thank you for your visit, you always manage to make me smile!